Leading Manufacturer of indented cylinders from New Delhi. Length grading of all granular materials. Cimbria Indent cylinders are used for length grading of all granular materials such as wheat, oat, maize, rice, fine seeds, lentils, sticks from sunflower or sugar beet, plastic particles etc., as well as for the extraction of unwanted short or long admixtures. Through the inlet housing, the granular material to be graded flows into the interior of the rotating cylinder whose cover is provided with special deep drawn „tear-drop or spherical„ shaped pockets for the most precise length separation. The grains that embed themselves fully into the indents will be lifted and after a certain distance fall out of the pockets under gravity into the trough and subsequently be discharged by means of a conveying screw. The kernels which are longer than the indent diameter will immediately slide out and remain on the inside surface of the indent cover. This shell product flows to the discharge point of the cylinder and will be discharged into the outlet housing. Cimbria will be sizing the exact machine for the separation and capacity required. The product line consists also of large models which give the customer the opportunity to use fewer machines. 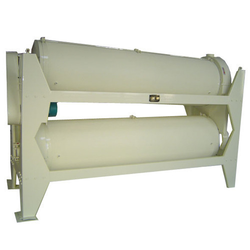 The Indented Cylinder Separators are supplied with rubber seals for preventing leakage and false feeding of seed into trough, individual drive for each cylinder and maintenance-free support bearings. The Indented Cylinder Separators are available in 10 different sizes with single cylinder throughput from 1 to 30 t/h. Looking for Indented Cylinders ?